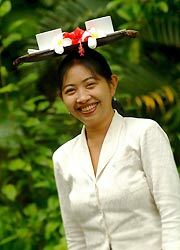 Bali In Pitamaha Resort & Spa which is facing to Tjamuhan Valley, Pita Maha Spa has the complete reservation system. It's a Balinese traditional beauty spa which can experience healing, health, beauty while looking around Tjampuhan Valley of Ubud. 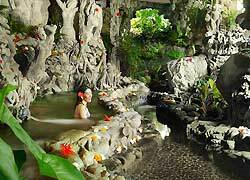 Please go out on the trip in the private space that 8m swimming pool and street stall Jacuzzi of equipped. Enjoy two hours the most Private Villa Spa in traditional Balinese atmosphere, overlooking to the Oos River valley inclusive of traditional Balinese Massage for one hour and enjoy the most complete spa facilities Sauna, steam, hot and cold jaquzzi as well as it's own eight meter pool. Herbal refreshment ginger tea after the treatment to stimulate your blood circulation in your own Private Villa Spa.We prepare Pita Maha special gift. A very special Set Indonesian Lunch or Dinner at our Terrace Restaurant with a very special Pita Maha's Ubud Mystery Cocktail. Please choose one from 2 menus below. Sate lilit ikan, minced Fish Drum stick Sate with mixed vegetables "Urap"
Relax with a traditional full body massage with your choice of aromatic Sandalwood, Rose, Lotus, Jasmine, Orange and Ylang - ylang perfume oils. A full- body massage without oil, focusing upon all body pressure with a through foot massage for overall body rejuvenation. The session concentrates on breathing and exhalation while pressure is applied. The perfect way to stimulate and refresh your skin. Using cleansing, toning and mask lotion of Biokos skin care products, this session includes a complete neck and shoulder massage. Enjoy the best that Pita Maha has to offer with a Tratiditional " Lulur ". Lulur is a herbal skin scrub followed by refreshing yoghurt massage for nourish your skin. 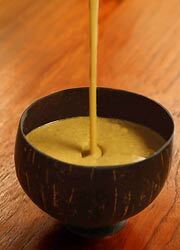 Finish with a tropical flower bath and herbal " jamu " beverage for slimming or rejuvenation. This ancient spice recipe of cloves, ginger, nutmeg and galangal root is designed to increase blood circulation. The mixture is lightly applied, then followed with a full acupressure body massage, complemented with a jasmine moisturizer. Trimming, grooming and polishing of the nails, including an arm and hand conditioning massage. If you swoon past a city coffee bar, imagine that smell for full 40 minutes, while the most fragrant of blends is applied gently to your skin to remove dead skin cell and smooth and soften the skin, then nourish your skin using grained carrot with 20 minutes Back Massage. Begins with 20 minutes Back Massage the scrub your body. It deeply cleans out your pores from unwanted dirt and skin debris, then it brings out the skin's natural shine and makes the skin looks more radiant. A specialized foot massage assisting in the relief of stress and tension. This technique helps to improve blood and nerve supply by reflex points on the feet. Stimulates and improves physical and emotional well being. Earth minerals help the body naturally cleanse and nourish the skin. The Clay is volcanic mountain earth blended with ylang - ylang flower water. Blends of earth-clay, essential oils and flowers to purify by the process of absorption draw impurities from the pores of the skin. Finish with yoghurt massage and natural Balinese flower lotion. The treatment included a traditional Facial Massage. Traditional herbal remedies have been used by the Balinese for thousands of the years, they believe these traditional medicines warms the body, relieve tired muscles and alleviate minor rheumatic conditions. Therapeutic herbs assist in the removal of toxins from the body and refresh your skin. 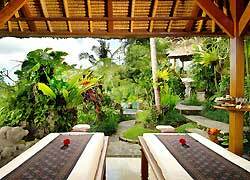 Begins with Traditional Balinese Massage followed by a herbal pound of the entire body. This opportunity allows you to refresh both body and spirit with a full body massage and herbal compress to penetrate the pores and transfer medicinal heat to the muscles inducing relaxation. The treatment continues with a deep cleansing facial and concludes with a nurturing aromatic herbal bath. Created to effectively cleanse and detoxify, this treatment involves a session of acupressure and a clay body masque which promotes the breakdown of toxins in the body that causes cellulite. A nourishing yoghurt body massage and gentle facial is followed by a fragrant flower bath to soothe the senses. This package has been created especially with a selection of masculine treatments designed to reawaken the senses. A firm pressure- point massage eliminating body tension is followed by a deep cleansing facial to freshen the skin and concludes with a session of gentle foot reflexology to stimulate overall circulation. This ultimate indulgence focuses on making you feel radiant with a relaxing lng stroke and palm pressure massage, traditional body scrub exfoliation to make your skin glow, nourishing facial, skin softening, yoghurt rub and luxurious soak in a tub of fragrant flower blossoms. The cancel fee charge 1 day before the reservation day. Facial was done very gently. It took the time to cleansing, massage and pack. My face stiffness was relieved by massage. I think it also improves lymphatic circulation and removes body waste.